Probable Ancestry of Sir George Buswell Jnr Founder of the Clipston Grammar School and "Hospital"
On the wall of the All Saints Church in Clipston, there are three life sized busts of three early prominent members of the congregation. 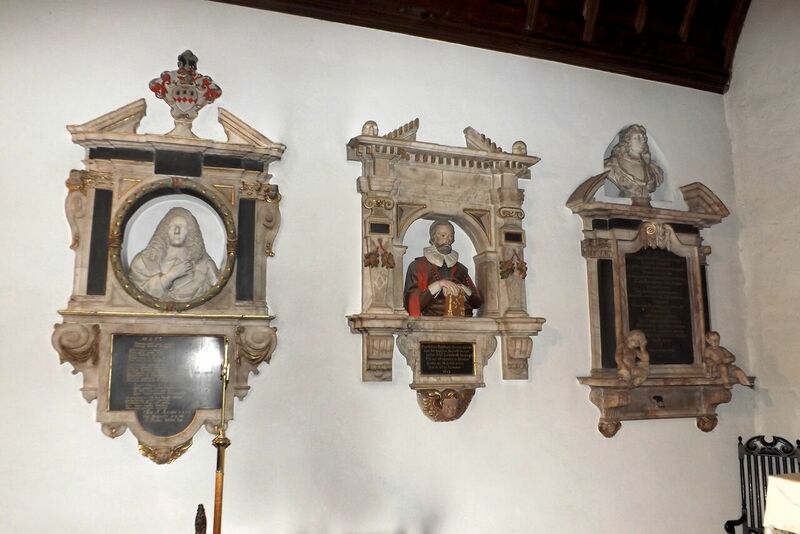 From left to right, the busts are John Buswell (about 1628-1659); Sir George Buswell, Snr. (About 1555-1632), an Alderman from the City of London, and Sir George Buswell, Jnr. (1626-1667). John Buswell and Sir George Buswell Jnr were sons of Sir George Buswell, Snr. The Buswell family evidently made major contributions toward the building of the All Saints Church in Clipston. Sir George Buswell, Jnr., and his wife, Katherine Enyon, founded a Grammar School and "Hospital" in 1667/1668, a short distance from the All Saints Church. The school is still in operation, after all these years. In 1956, Sir Gyles Isham, Baronet, wrote a history of the School, entitled, The Story of Clipston Grammar School, Northamptonshire. In this history, Sir Gyles included a pedigree chart of the Buswell family, which shows that Sir George Buswell, Snr. was the son of John Buswell, a Yeoman from Dishley Grange, Leicestershire, and his second wife, Marie Botham. I believe that this John Buswell was born in Clipston, and was engaged in the sheep and wool trade later, in Dishley Grange, Leicestershire, with Marie Botham's father, John Botham, a Draper from Derbyshire. This John Buswell was almost certainly married first to a woman with the surname of Allestre, and they had five children together: Thomas, William, Roger, James, and Elizabeth. Sir Gyles Isham wrote in his book on the ClipstonSchool that Thomas Buswell (the eldest son of John Buswell of Dishley Grange) lived in a home across the street from the All Saints Church, which was in the family for many years. In fact, the owner of the home in 1956, Mrs. Winifred Wilford, was a Buswell by birth. After his first wife died, John Buswell married Marie Bothom, the daughter of his friend and/or business partner, John Bothom, in the wool trade. John Buswell and Marie had four children, the oldest of which was Sir George Buswell, Snr. the Alderman from London. The other three children of this second marriage were Clement, John Buswell Jnr and Patience. John Buswell of Clipston and Dishley Grange was almost certainly the son of Thomas Bosville of Tickhill, Yorkshire, and Ann Sanderson, of Sandbeck, Yorkshire; however, this is unproven at the moment. No one that I know of knows the reason why the spelling of the surname was changed from Bosville to Buswell, though a great deal of effort and money has been expended by me and others, trying to find out the reason for the name change; and to confirm the ancestry to the Bosvilles of Gunthwaite, Yorkshire. 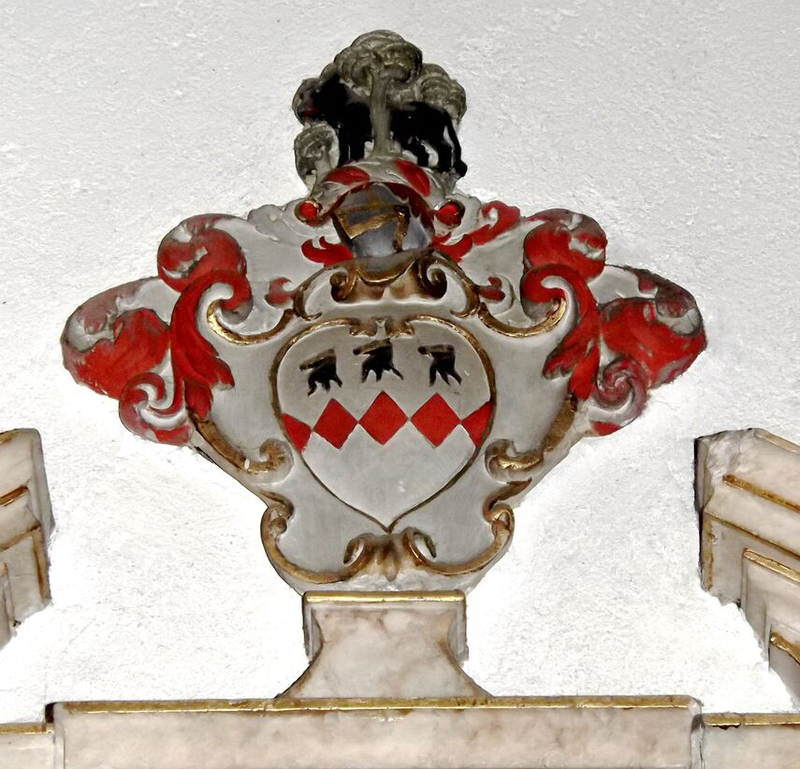 (1) The bust of John Buswell on the wall of the All Saints Church in Clipston, has a crest over it, that is unique to the Bosvilles of Gunthwaite, Yorkshire. The three Bear's Heads on the crest have muzzles on them. This crest ties the Clipston Buswells, unmistakably, to the Bosvilles of Gunthwaite, Yorkshire. (2) On page 17 of the book, The Story of Clipston Grammar School, Northamptonshire, by Sir Gyles Isham, Baronet, there is a letter written by Lady Katherine Enyon Buswell, wife of the founder, that is sealed with the "Good seal; Bosville of Yorkshire." In my opinion, the most likely candidates for the parents of John Buswell, Yeoman, of Clipston and Dishley Grange, are Thomas Bosville, of Tickhill, Yorkshire, and Ann Sanderson, of Sandbeck, Yorkshire. It does not appear to me that there are any other Bosvilles in the Gunthwaite Branch that could be John Buswell's father; but the link is unproven so far. 1. The Glover Chart, prepared by Richard Glover, the King's Cartographer, in 1586. The original chart is two feet wide and ten feet long, and is kept in a climate controlled vault in Hull, Yorkshire. This chart begins in 1066 with Sir Martin Bosville (some other sources say his name was Sir Robert Bosville), the Treasurer of the Army of William the Conqueror; and the Treasurer of England under King Rufus, William's son. The chart follows, primarily, the descendants of the Bosvilles of Gunthwaite, Yorkshire, and their marriages into other prominent English families. This chart is is beautifully done, in colour. It was commissioned by Sir Godfrey Bosville, Esquire, who lived between about 1519 and 1580. 2. The Parent Tree of the Boswell Family, printed by Jasper John Boswell in 1900, prior to the publishing of his book in 1906. This is the most complete chart on the family, because it attempted to cover all of the branches of the Boswell family up to that time. It includes the ancestry and descendants of the famous James Boswell, of Auchinleck, the biographer of Samuel Johnson, who descended from the Scottish branch of the Boswell family. This chart also begins with Sir Martin Bosville. When Jasper John Boswell printed his book six years later, in 1906, he said that the founder of the family was now known to be Sir Robert Bosville, rather than Sir Martin. 3. The Bosvilles of Gunthwaite, Yorkshire, by William Radcliffe, Rouge Croice, in 1814. It begins with John Bosville and Muriel Barnby, of Gunthwaite, Yorkshire, and continues that branch of the family to 1814. 4. Pedigree of Bosville, of Ardsley, Gunthwaite, Warmsworth, Ravenfield, & c.
5. The Descent of the Ancient Family of the Bosvilles of Gunthwaite, compiled by John Charles Brooke, 1772. 6. Genealogical Table 1 of the Bosville Family, by J. H. Baverstock, F.S.A. 7. Many charts on different branches of the Bosville family in the two volumes of South Yorkshire, by Reverend Joseph Hunter, Printed in London in 1831. The official title of these two volumes is, The History and Topography of the Deanery of Doncaster, in the Diocese and County of York. 8. Some charts and commentary on the Bosville family are included in the book, History of Hallamshire, (in the Sheffield area) also by Reverend Joseph Hunter. 9. On pages 169 and 170, of The Visitation of Kent, 1619, there is a chart of the descendants of John Bosville and Alice Darfield for fourteen generations. 10. Genealogical Table of the Boswell Family, on the wall of St. Peter's Church, Cobourg, Ontario, Canada. I have corresponded a great deal with a living descendant of Sir Robert Bosville, whose name is Walter Edward "Ozzie" Boswell, of Dundas, Ontario. He has a direct line connection to a person on this chart by the name of John Boswell, of Alverstoke, and afterwards, of London, Solicitor and Notary, who died 25 December 1828. John Boswell of Alverstoke's ancestry on this chart goes all of the way to Sir Robert Bosville. There are minor differences in the first four generations at the top of some of these charts, but they all agree from the first John Bosville, who married Alice de Darfield, in the fourth generation from Sir Robert Bosville. A. Family History Library of ‘The Church of Jesus Christ of Latter-day Saints’, in Salt Lake City, Utah. B. Library at Yale University, in New Haven, Connecticut. C. Wilson Collection at the Brotherton Library, at the University of Leeds, in Leeds, England. D. Brynmor Library at the University of Hull, in Hull Yorkshire. E. College of Arms, in London, England. F. British Library, in London, England. I have been to all of these sources, and have spent considerable time studying each of their collections on the Boswell family. Sir George Buswell, Jnr., Baronet, the founder of the Clipston Grammar School and "Hospital." He made provisions for the school in his will, dated 18 March 1667. He died 6 March 1668. His wife, Katherine Enyon, daughter of James Enyon, Baronet, of Flore, Northamptonshire, followed through with the construction. Sir George Buswell, Snr. Alderman from the city of London; and his wife, Elizabeth Kynnesman, daughter of Harold Kynnesman, Esquire, of Broughton, Northamptonshire. John Buswell, Yeoman, of Clipston, Northamptonshire, and Dishley Grange, Leicestershire; and his second wife, Marie Botham, daughter of John Botham, a Draper from Derbyshire. Almost certainly, Thomas Bosville of Tickhill, Yorkshire; and his wife, Ann Sanderson of Sandbeck, Yorkshire, daughter of Thomas Sanderson, Esquire. John Bosville, Esquire, of Gunthwaite, Yorkshire; and his wife, Anne Clapham, daughter of Thomas Clapham, of Beamsley, Yorkshire. Richard Bosville, Esquire, of Beighton, South Yorkshire; and his wife, Jane Neville, daughter of Thomas, or Robert Neville (of royal ancestry). John Bosville, Jnr., Esquire, of Newhall and Ardsley, Yorkshire; and his 2nd wife, Isabel Cresacre, daughter of Percival Esquire, of Barnburgh, South Yorkshire. John Bosville, Esquire, of Ardsley and Newhall, Yorkshire; and his wife, Isabel Dronsfield, daughter of William Dronsfield, Knight, of North Emsall, Yorkshire. Roger Bosville, of Ardsley East, West Yorkshire; and his wife, Alice. Thomas Bosville, Under Sheriff of Lockwood in 1348, of Ardsley East; and his wife, Alice Gunthwaite, daughter of John de Gunthwaite. Adam Bosville, Lord of Ardsley; and his wife, Matilda, of Yorkshire. Peter de Bosville, of Ardsley East; and his wife, Beatrix de furnival, daughter of Gerald or Gerard de Furnival, Jnr., Lord Furnival, Lord of Sheffield and Hallamshire. John de Bosville, Knight, of Ardsley East; and his wife, Alice de Darfield, daughter of Hugh de Darfield, Lord of Newhall and Ardsley. Elias de Bosville, Knight, of Castle Acre, Norfolk; and his wife Miss Newmarch, daughter of Adam de Newmarch. William de Bosville, Knight, of Castle Acre; and his wife, name not known to me. Sir Robert Bosville, of Bosville, in Normandy, France, Treasurer of the Army of William the Conqueror, and Treasurer of England under King Rufus, William's son; and his wife. On page 5 of the book, Fortunes of a Family, it says that the wife of Sir Martin Bosville [Sir Robert in some other sources], the Treasurer , was the daughter of Hugh Lupus, 1st Earl of Chester of the second creation. The first Earl of Chester was originally Gerbod the Fleming. Gerbod was taken prisoner at the Battle of Cassel in France; and the King vacated his title, and gave it to Hugh Lupus. The assertion that the daughter of Hugh Lupus was the wife of Sir Robert Bosville is challenged by at least one prominent author on the Boswell family, stating that it was not probable. The reason given was that if Miss Lupus was in reality, the wife of Sir Robert Bosville, the family would have been much wealthier. Hugh Lupus was the son of Richard le Goz, Viscount of Avranches--one of the wealthiest men in England and France. According to Wikipedia, Richard le Goz furnished 60 ships to William the Conqueror, to use in the assault on England in 1066. Also, since Hugh Lupus was born in about 1047, his daughter was probably not born until the 1060's, making it a difficult connection, timewise, to Sir Robert Bosville, who was the Treasurer of the Army in 1066 (unless, of course, Miss Lupus was much younger that Sir Robert Bosville). The author would welcome any information from any reader of this article that sheds any light on any of the assumptions shared in this article.